MWE Reel unit designs adopt the Garret reel principle. 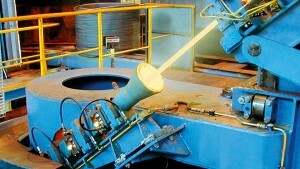 They perfectly complement rod mills in applications where steel bar coils are to be produced. Reeling units can be easily retrofitted, adding to the flexibility of rod mills to cover product sizes from 5.5 mm to 42 mm for rounds and rebars. Reel units can be physically located downstream of existing rod finishing equipment, permitting steel bar coils to be easily handled.